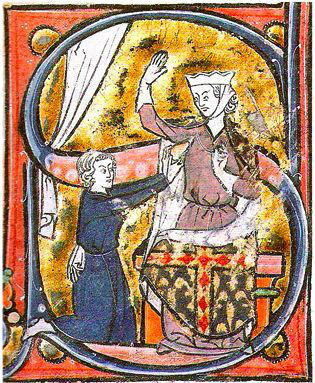 Embellished "S" in French manuscript. 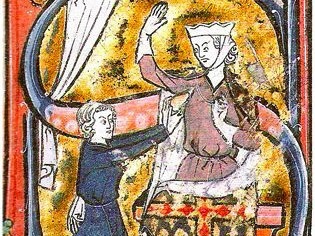 According to Wikipedia, one of the first depictions of a heart as a symbol of romantic love dates to the 1250's. In it a lover hands his heart to a lady. The heart resembles a pine cone. 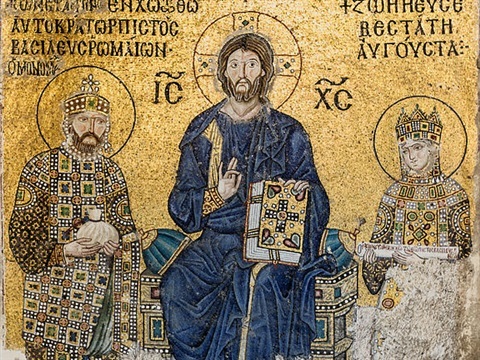 Zoe mosaic in Hagia Sophia, Istanbul, Turkey. 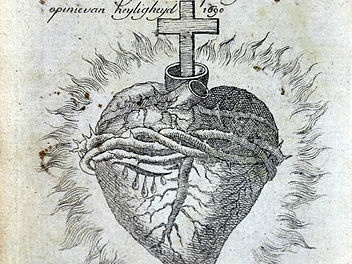 Hearts are linked with depictions of Christ. 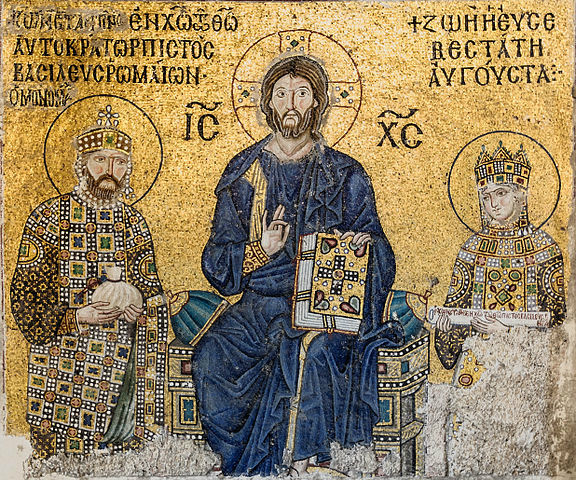 In the above from the Empress Zoe mosaics, Christ is seated in the middle of the picture with the Emperor Constantine and the Empress Zoe (1239). 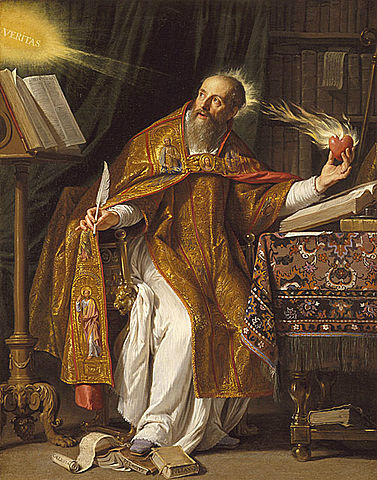 Look at the hearts on the bible! The Sacred Heart of Jesus is the Catholic devotion that focuses on the love and compassion of the heart of Christ towards humanity, and its long suffering. 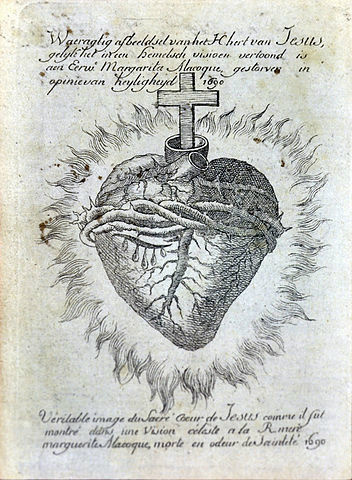 The sacred heart is often depicted as a flaming heart shining with divine light and might be pierced, encircled with thorns, bearing a cross, or bloody. Someday I will understand this. 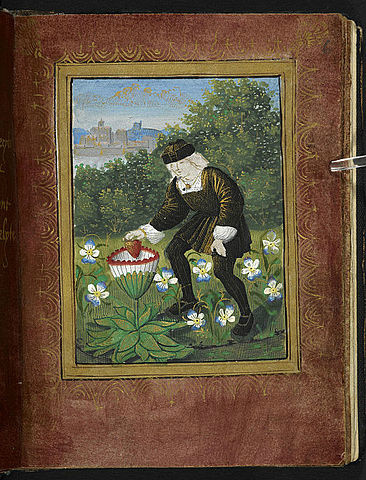 A painting on the cover of a book showing the author, Pierre Sala, depositing his heart in a flower symbolizing his mistress. Ladies!! Finally a definitive map of your innermost desires! 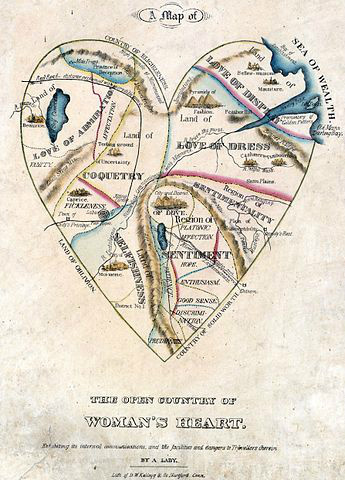 This awesome lithograph from the 1830's attempts to map the desires of every woman encompassed in a heart. 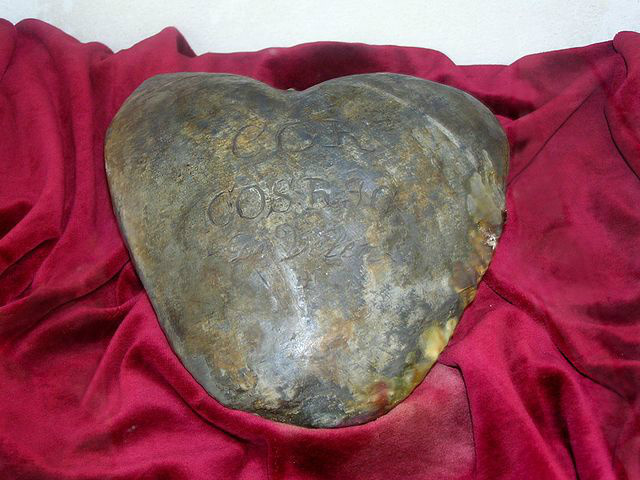 It is attributed to "A Lady" and was published with a companion Map of the Fortified Country of Man's Heart. Regions include sentiment, hope, enthusiasm, good sense, discrimi/nation (get it? ), prudence, platonic/affection and friendship. In the land of COQUETRY you will find caprice, fickleness, and the labyrinth of false hopes. When I was in Jr. High back in Springfield, Oregon, I went out for almost every school sport available. Perhaps the one I was worst at was gymnastics. I could never seem to get my long legs to straighten-out when doing a cartwheel, and the back flip always eluded me. I wasn't too shabby at the uneven bars, and that is where I lost my heart for the first time. Let me be clear, it was attached to a birthstone ring. My darling Aunt and Uncle had given me a sweet tourmaline ring for my birthday. It was heart-shaped and the ring was gold. I loved it and wore it all the time. This ring was really my first piece of "grown-up" jewelry. One day during afterschool gymnastics practice I took off my heart ring to do the uneven bars. I distinctly remember putting it next to the bars on another piece of equipment. What do you know... when I got off the bars and went to put my ring back on it was gone. Yep, some little Jr. High biatch (or biotch depending on which slang dictionary you subscribe to) stole my ring. Years later, my wonderful husband gave me a lovely heart-shaped diamond solitary ring which I wore on my right hand until I hit it on a metal door jam at school and proceeded to pop the diamond right out of the setting. My biggest memory of that incident is of all the sweet ladies who were attending a PTO meeting getting down on their hands and knees in the hallway and looking for it! Never found that darn stone. This story has a happy ending, though. 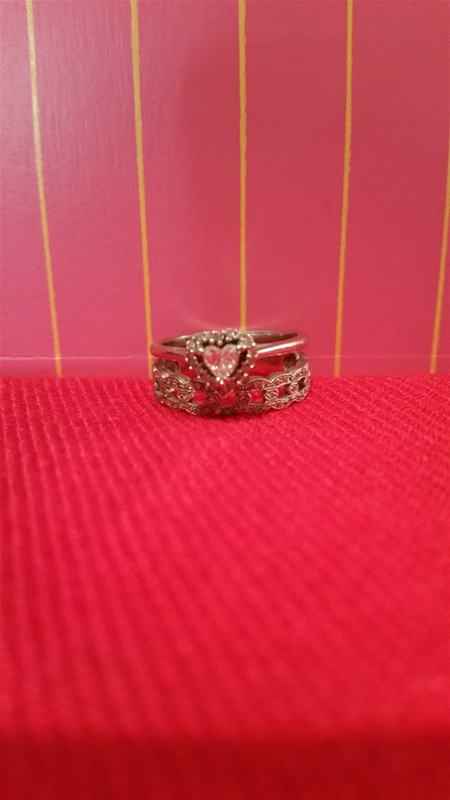 My hubby gave me another heart when we updated our wedding rings a couple of years ago. So far the ring is still intact on my finger and is a daily reminder and symbol of our devotion for one another. 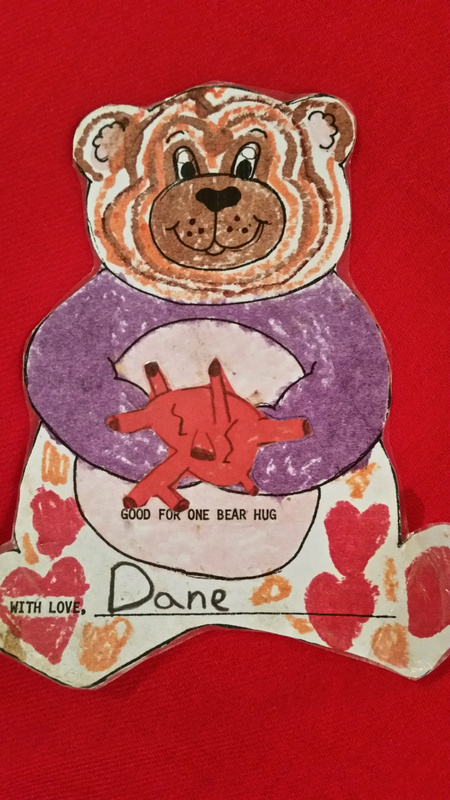 Of course when my son was in 2nd grade he made the heart anatomically correct. 1. A heart charm bracelet that I had made for my mommy using all of the separate hearts I had found in her jewelry box. 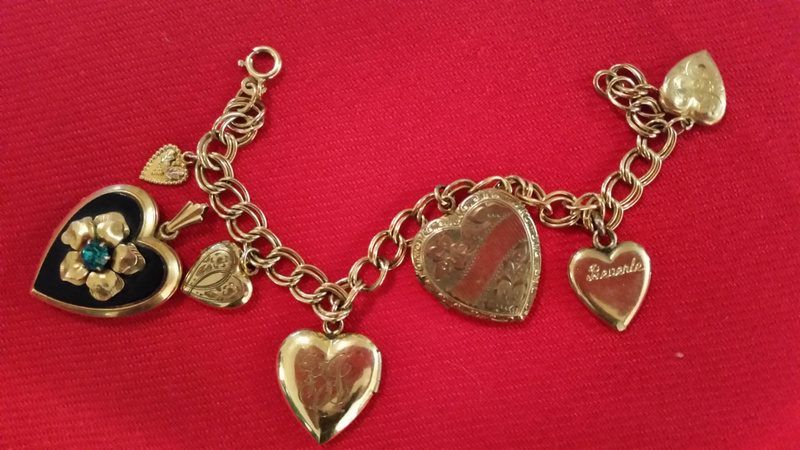 This bracelet includes vintage hearts with tiny pictures in them from my grandmother and aunt. 2. My collection of heart rocks. This collection changes due to me giving away the rocks to various friends and family. 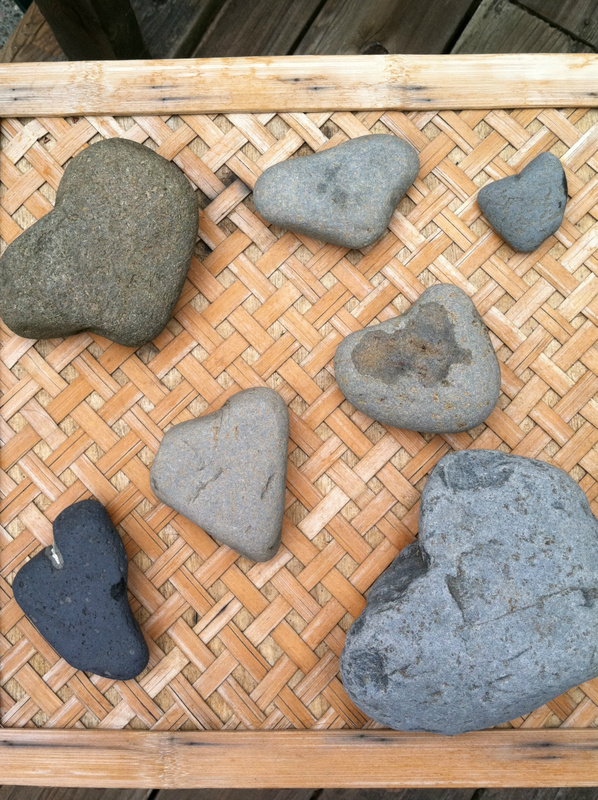 I began collecting heart-shaped rocks a few years ago when I went to the Oregon coast near Oceanside every spring to find river rocks for my first grade classroom. I used to hot-glue googly eyes on them and give them to the kids as "reading buddies." 3. 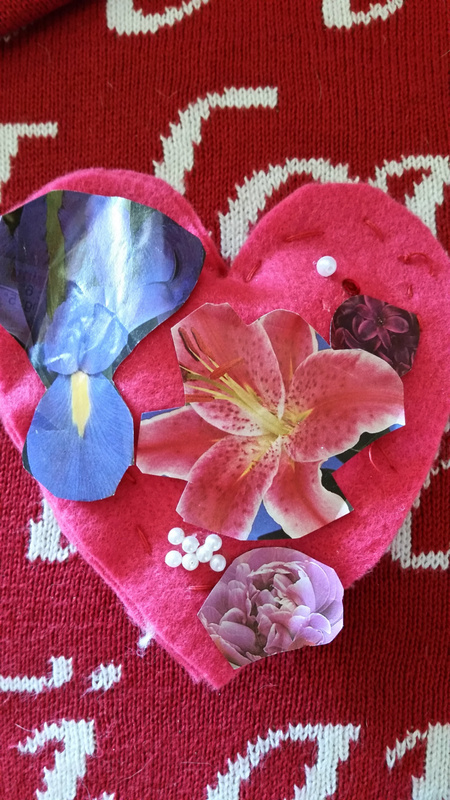 A felt heart sachet that my daughter made in elementary school and hand sewed. It has flower cut-outs from magazines and little pearls on it. 4. A great shirt vintage 2013 from the Lauren Conrad collection at Kohls. Looks great under a suit jacket. And yes, that's a Victoria's Secret bra with hearts on it circa 2015! 5. A little red sign that I have hung in my walk-in closet. 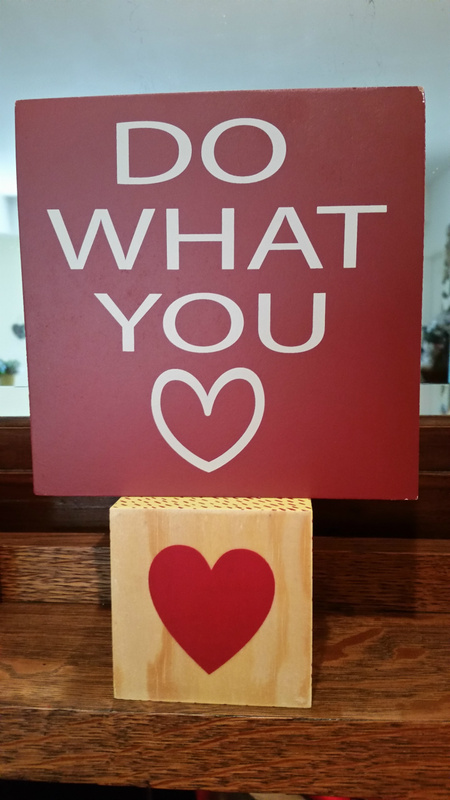 I look at it every day while thinking about what I love to do and what I should be doing. 6. 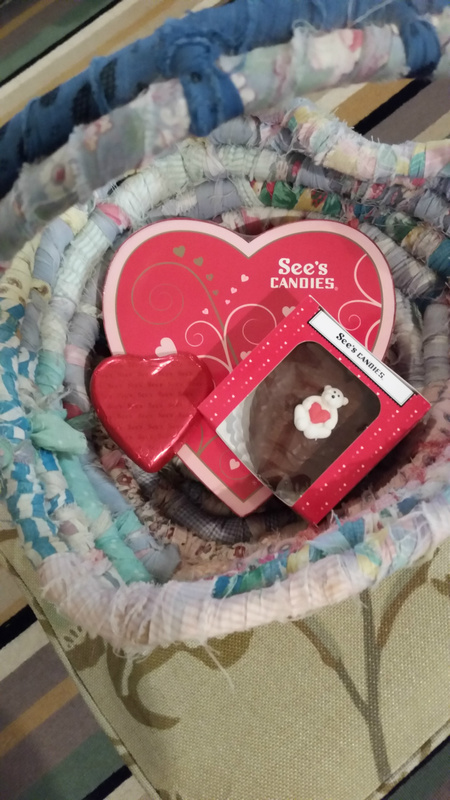 My favorite chocolate - Sees - in my favorite heart basket. 7. 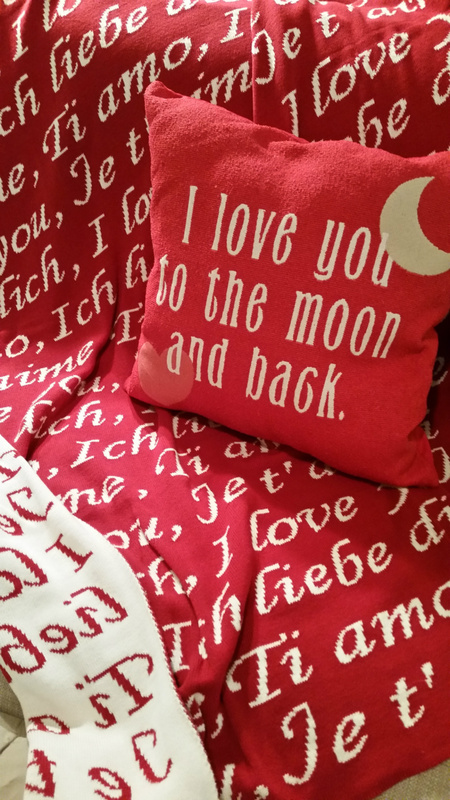 Valentine pillow (pink heart on bottom left) and Barnes and Noble love quilt with the "I love you" in different languages. 8. 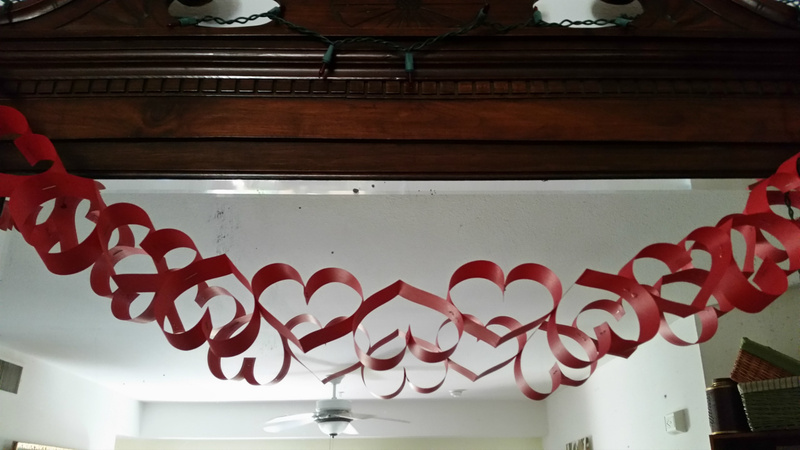 A red paper heart garland I made for the buffet mirror. 9. 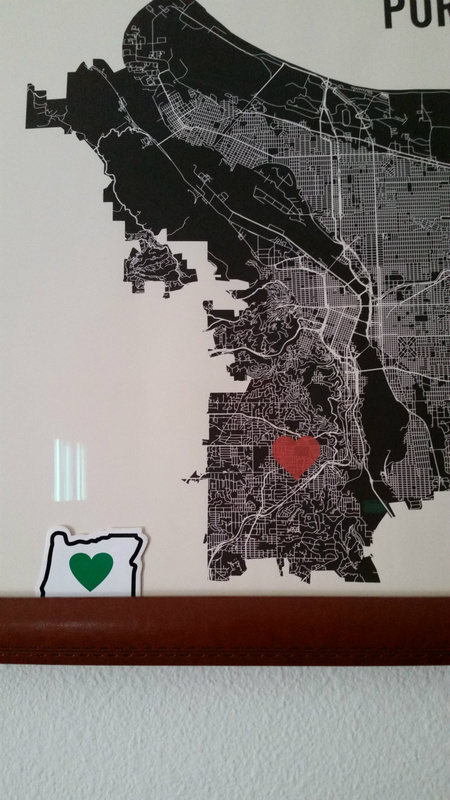 Map of Portland, Oregon with SW Portland marked with a red heart. Our daughter ordered this from Etsy two years ago. 10. 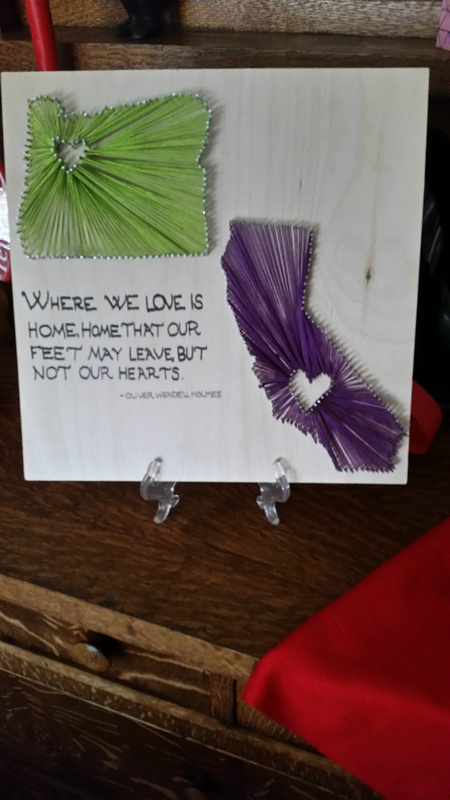 Amazing DIY project made by a sweet friend depicting love in Oregon and California with the quote from Oliver Wendell Holmes. "Where we love is home. Home that our feet may leave, but not our hearts." *See the slide show below for the accompanying pictures.